1)Soak the dried mushrooms in warm water for at least 30 minutes. After trimming off any tough stems, slice the mushrooms. 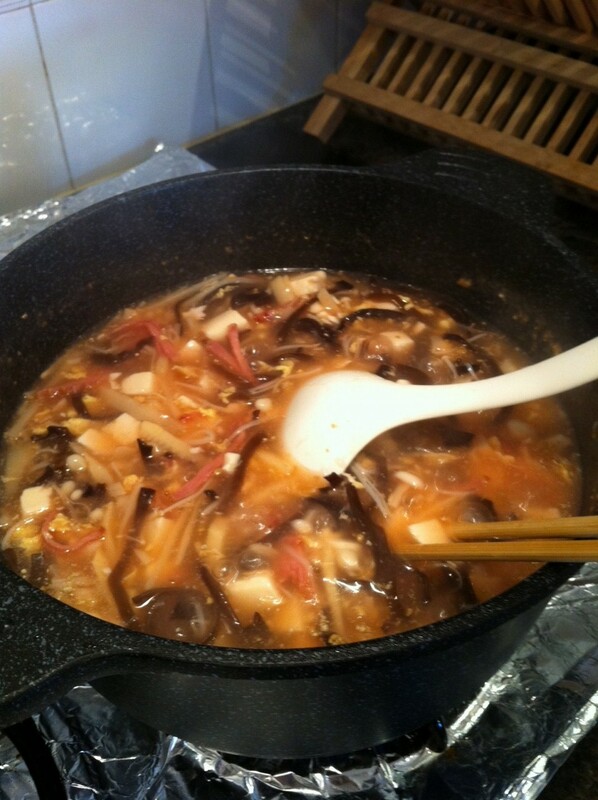 2)Place the wood ear mushrooms, Enoki mushrooms, bamboo shoots, and sliced ham into a saucepan with 1 teaspoon oil , stir them a while, then add water and chicken broth, boil for 10 minutes. Add the bean curd, and cook 1 to 2 minutes. 3)Stir in soy sauce, sugar, salt, white pepper, and vinegar. 4)Combine cornstarch with 3 tablespoons water. Add a little of the hot soup to the cornstarch, and then return all to the pan. Heat to boiling, stirring. 5)Just before serving, turn off the heat. Stir the lightly beaten egg in gradually. Mix in sesame oil. Sprinkle each serving with green onion.